Do you want your gift to make the most lasting impression ever? 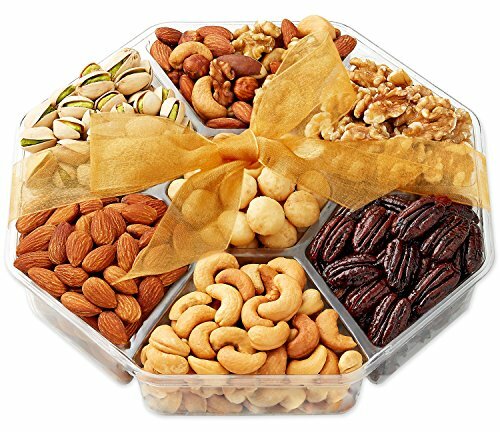 Give a elegant assorted nuts gift basket of the most exquisite variety of nuts! You may have sent a dry fruits gift box in the past only to find that it was of poor quality, unattractive, of stingy appearance, and worst of all, the contents were stale, and not tasty at all. Don't you want your gift to convey the perfect message? Send this gourmet gift tray now! - This gourmet nuts gift is packaged beautifully and is very sharp. - This dried fruit nuts is savory and fresh. - It is presented in a classy seven sectional tray, tied with a gold organza ribbon and bow. - All the nuts that made it into this nut gifts were hand selected so that your recipient receives only the best. - Great for any occasion elegant or casual. - Our buyers love it and so will you. - Created for making a fantastic gift giving experience. When you order now, you are protected by a no questions asked full money back guarantee. Your satisfaction is our goal. SEND IT RISK FREE AND EXPERIENCE THE APPRECIATION! Your recipients will forever be grateful and mindful of your generosity or your money back, no questions asked - Place Your Order Now! If you have any questions about this product by Hula Delights, contact us by completing and submitting the form below. If you are looking for a specif part number, please include it with your message.